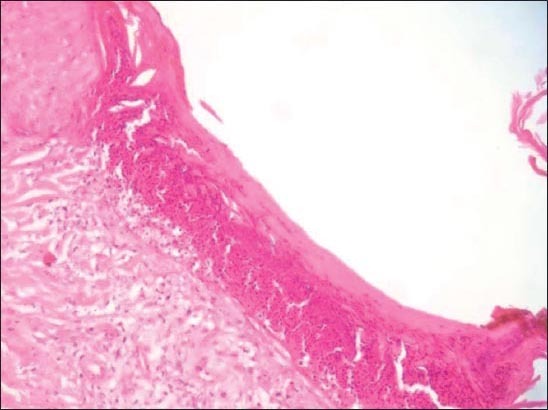 Kyrle disease is an uncommon perforating dermatosis which is commonly associated with systemic disorders such as diabete mellitus and renal failure. A 60-year-old man, with no past medical history, consulted for purpuric, infiltrated and crusted lesions of extremities, buttocks and scalp. 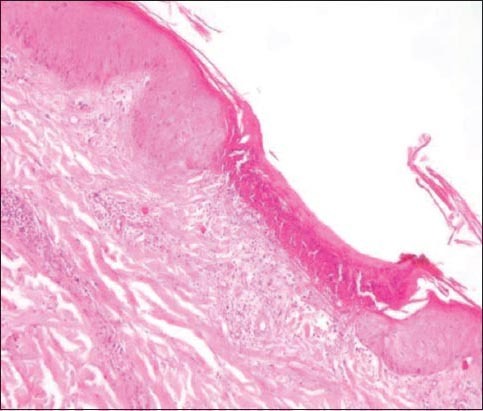 A punch biopsy showed a hyperkeratotic horny plug invaginating the epidermis. The diagnosis of Kyrle disease was retained. The clinicopathological features of this disease and its therapeutic problems are discussed. Kyrle disease (KD) was first described in 1916 by Kyrle under the name of hyperkeratosis follicularis and parafollicularis in cutem penetrans . As he described, this is a disorder characterized by the formation multiple hyperkeratotic follicular and parafollicular papular lesions with a central keratotic plug. It is considered as a variant of primary perforating dermatoses which share the same pathophysiology: a transepidermal elimination of dermal substances . The prognosis depends essentially on the association with some systemic disorders such as diabetes mellitus, renal failure, liver disease, congestive cardiac failure hyperlipidemia, etc . A 60-year-old man, diabetic, consulted for papulo-nodular lesions mainly located on the extremities. He had no medical past history particularly of renal failure or diabetes millitus, On examination, there were multiple erythematous, purpuric, infiltrated and crusted papulo-nodular lesions with central keratotic plug located on the forearm, legs (Fig. 1), buttocks and scalp. A punch biopsy of an active lesion was performed. It showed a hyperplastic and hyperkeratotic epidermis with a central invagination. This invagination was filled by a hyperkeratotic horny plug and extended to the superficial dermis (Fig. 2). At this point, the lesion was stressed by a fibrino-leukocytic material. The papillary dermis was loose, edematous, inflammatory and congestive (Fig. 3). The diagnosis of KD was retained. The patient was treated by topical steroids with good evolution. 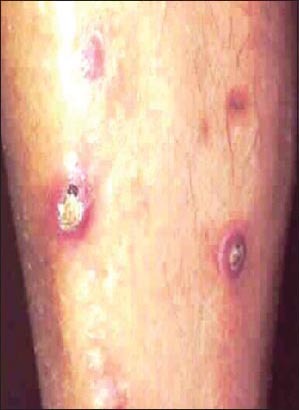 Figure 1: Erythematous, purpuric, infiltrated and crusted papulo-nodular lesions of the leg. Figure 2: A partially parakeratotic plug fills an epidermal depression (HEx200). Figure 3: A keratotic plug stressed by a fibrino leukocytic material overlying the papillary dermis which is loose, edematous, and inflammatory (HEx400). Primary perforating disorders include Kyrle disease (KD) elastosis perforans serpiginosa, perforating folliculitis and reactive perforating collagenosis . KD is a rare disorder of keratinization particularly observed in the setting of chronic renal failure and occurs in 10% of hemodialysed patients . It affects both men and women throughout life, with a mean age of 30 years at onset . However, cases in children have been reported . KD seems to affect more frequently African Americans. The incidence of diabetes mellitus and renal failure is high in this population. Perforating dermatoses are quite rare. Thus, their pathogenesis is still misunderstood . Some cases seem to be idiopathic inherited, but in other cases, KD occurs as cutaneous manifestation of a systemic disorder (diabetes mellitus, hepatic abnormalities, congestive heart failure, renal disease). The role of infectious agents, probably anaerobic bacteria, was suggested by some authors [4, 5]. Clinically, KD is characterized by silvery or red-brown papules or nodules centered by keratin plug or crusts. Some lesions appear to be follicular. They are not typically painful but may be very pruritic. Koebner’s phenomenon is exceptional. The lower extremities are mostly affected. Lesions may also develop in the arms and in the head and neck region. Keratotic lesions of conjunctiva and cornea were described in a single case report. Histologically, Constantine and Carter suggested the presence of some criteria to diagnose KD: keratotic plug filling an epithelial invagination, parakeratosis in parts of the plug, basophilic cellular debris which does not stain with elastin stains and parakeratotic keratinised cells in at least one area deep to the plug. The clinical and histological differential diagnosis can be difficult between KD and perforating folliculitis because they are quite similar. The elastosis perforans serpiginosa should also be evocated . Rapid improvement of lesions is often seen once the underlying disease is treated. Treatments that have been used to treat and reduce lesions include Isotretinoin, high dose vitamin A, Tretinoin cream, emollients and oral antihistamines. The evolution of KD is unpredictable. The absence of a therapeutic consensus is due to the little number of reported cases. Therefore more cases are needed to understand the underlying pathogenesis and to improve the management. 1. Arora K, Hajirnis KA, Sawant S, Sabnis V, Gaikward N, Perforating disorders of the skinIndian J Pathol Microbiol 2013; 56: 355-8. 2. Schreml S, Hafner C, Eder F, Landthaler M, Burgdorf W, Babilas P, Kyrle disease and acquired perforating collagenosis secondary to chronic renal failure and diabetes mellitusCase Rep Dermatol 2011; 3: 209-11. 3. Akçal? C, Baba M, Seçkin D, Kyrle’s Disease: A Case ReportJ Turk Acad Dermatol 2007; 1: 71401c. 4. Viswanathan S, Narurkar SD, Rajpal A, Nagpur NG, Avasare SS, Rare presentation of Kyrle’s disease in siblingsIndian J Dermatol 2008; 53: 85-7. 5. Kasiakou SK, Peppas G, Kapaskelis AM, Falagas ME, Regression of the skin lesions of Kyrle’s disease with clindamycin: implications for an infectious component in the etiology of the diseaseJ Infect 2005; 50: 412-6.